It is no more acceptable to wait for the passengers to come in. Based on the first design space, Samsung needs to actively awake their curiosity with concrete and exciting design, which is personalized, appealing, and sustainable with new content. 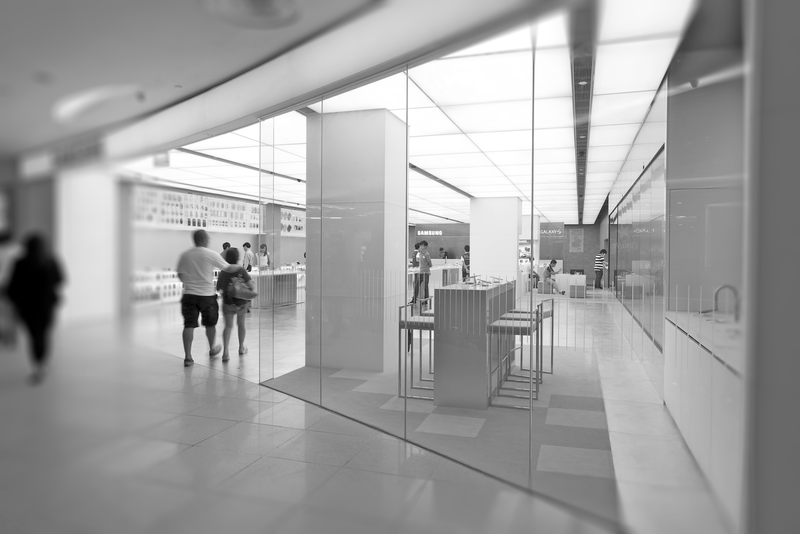 We found that the front side of most Samsung Experience Stores is made from glass panel walls. It occurred to us that the entire store could be viewed as a huge shop window and these glass panels are our perfect carrier to interact with passersby. The glass panels we designed will engage with customers naturally using eye recognition technology to catch their attention through recognized sights. With a face recognition camera, the glass can identify customers’ line of sight and then show relevant information on the glass. E.g., A customer glanced at the latest model on the counter through the glass, then an enlarged 3D model will appear on the glass immediately, which can even rotate along with the user’s line of sight. The information on the glass panel will be different depending on the customer’s line of sights. Using both facial recognition technology and the interactive glass panel, every subtle curiosity of customers can be sent back to micro-interactions, which can bring them surprises and further stimulation to explore the store. People want to explore freely, but they also need guidance because they don’t know how to experience the phone. We designed a prototype of a mobile phone tutorial application but found that it can merely be some extra vivid introductions. In user tests, we found people can only operate according to the established process which is a big limitation for users to explore. Thus, some participants even assumed that our prototype is an interactive advertisement on the phone. We decided to keep the phone intact but complement the experience with a dual-screen system. This is a smart and considerate system that can know what you are going to do and then show proper information to assist people to discover more excitement. There is another screen next to each phone for the user to operate. 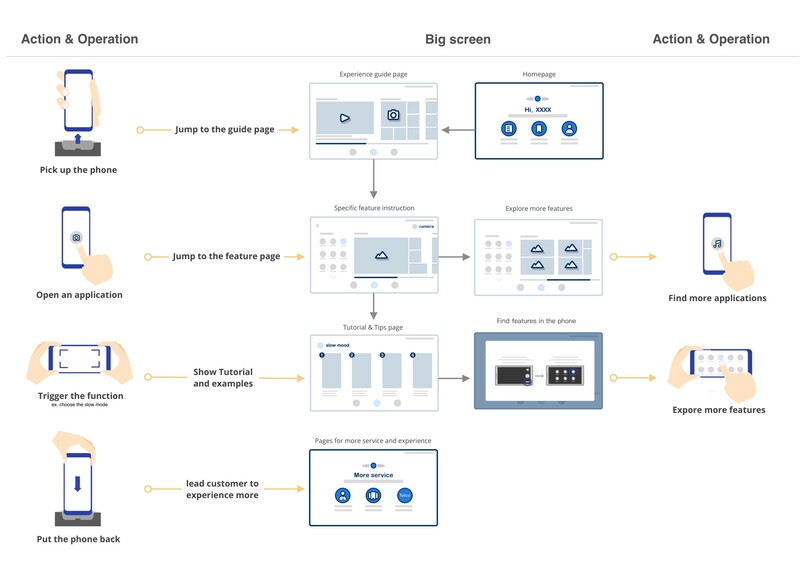 No matter which screen you are manipulating, the other one will correspondingly show relevant content to help you get an in-depth experience. When a user is using the mobile phone, the system can recognize what he is doing and recommend relevant information on the big screen such as function introductions, special mode, and usage tips. If he finds a new feature on the big screen, he can also find a tutorial that tells him how to find and appreciate the feature on his phone. For instance, when you pick up a phone, the big screen will automatically wake up and show you a home page of features tour, which gives you an overall idea of what you can experience. After you browse through the introduction of a function module, the big screen will also invite you to pick up the phone to experience the real effect. When the camera app is opened, relevant information about the camera (wide lens, video recording etc. )will be displayed immediately on the big screen. For some customers, service from the salesman is not expected before they ask for it. Otherwise, they will feel particular pressures from the stuff. Feeling like they are being monitored or followed is not what we want. Instead, we are eager to create the “sense of accompanying” in the experience center. The user-led principle should be highlighted, as we are aimed to better understand customers rather than merely to promote phones. So we designed a Soul system with the intelligent assistant “Bixby” to accompany users all through exploring in the store, comfortably, reliably, and without any pressure or disturbance. We applied Bixby, Samsung’s intelligent assistant, into the soul system. Bixby can be seen in the store. When customers put down the phone, Bixby will be transformed into a stream of light and lead you like a guide to where you want to go. She will also constantly understand customers’ action and purpose during the experience. When the customer is experiencing the second mobile phone, she will adjust the recommendation according to the first situation. In this way, all the activities of the customers in the store will be coherent. For example, when a customer experience a mobile phone, Bixby can detect his interest in high-quality music, so when he is in the accessories area, Bixby will present more information about high-quality headphones. For Samsung users, I look forward to bringing them more. Samsung users can be an identity that may interest you. 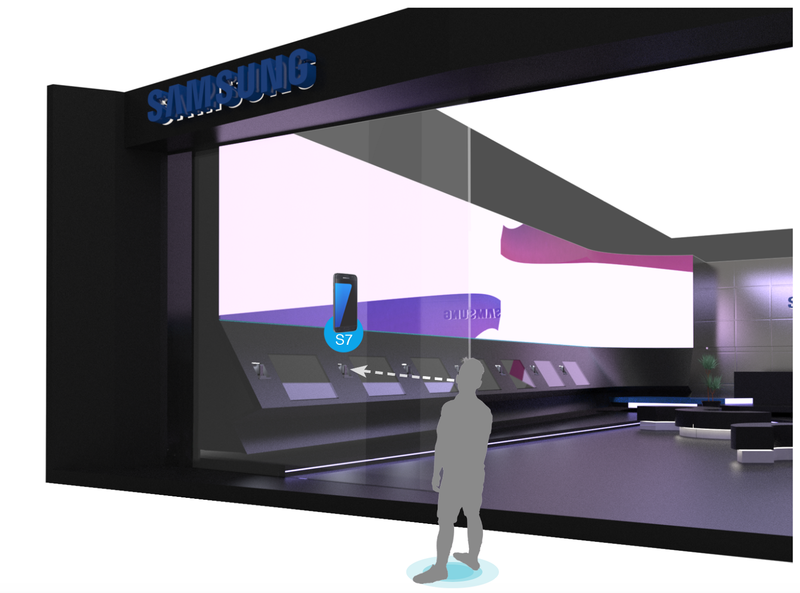 Customers should feel they are the protagonists of experience with a strong sense of presence — “Hey, Samsung user, it is the start of your journey!” Apparently, we must get to know our customers, instead of waiting for them to unveil the store. 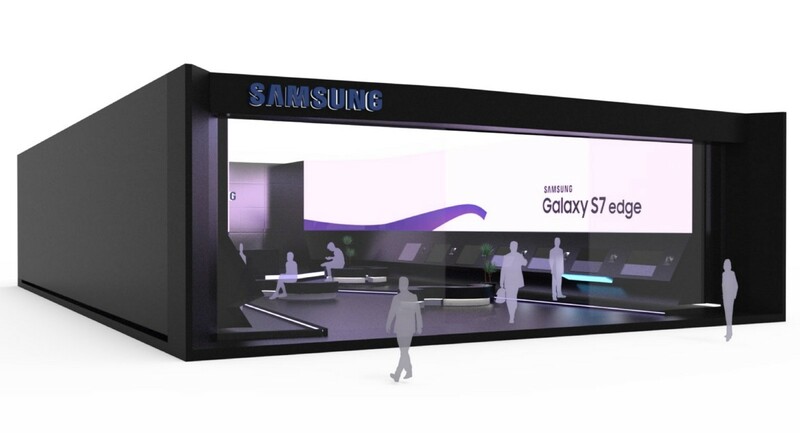 Invitations will be sent to Samsung users when they are near the experience store. After they accept the invitation and enter, Bixby will greet them as a friend. It could also be an exciting journey as a Samsung user. This means when a Samsung user starts to experience, specific content is prioritized according to the user’s habits. By analyzing primary, observed, and driven data, Bixby can sense their habits of using the mobile phone as well as their hidden needs more accurately. People don’t have unlimited time or diverse interests in experience everything, so giving what they genuinely care about directly is crucial. By every point we recommend, we wish they could feel excited by saying “This is what exactly I what” inside. 3. Be your partner: accompany you every day. Samsung, Maybe not just a mobile phone brand, but also a partner who always accompany you to experiences life. Mobile phone, for people in today’s society, is beyond the concept of just an electrical device. They are now embedded in people’s daily lives. Through this always-on alway-connected and always-carried “witness” of our life, we may be able to understand ourselves from another perspective. Experiencing a new phone perhaps means experiencing the next phase of your life. By creating unique stories through several timelines, users can recall some moments that may have forgotten but definitely worth remembering. The “soul system” help select those valuable data and combine them in a well-organized story, which acts like an evocatively trigger that remind users of important events and dates they created with Samsung. Special moments such as trekking expeditions recorded by Samsung health and Camera are displayed in the Memory gallery for users to share on social media. Regardless of whether users can be aware of it, Samsung has always been with them, recording the beauty of their lives. When being faced with several potential proposals, though none of them is perfect, we have to decide one direction for further development. So according to the design principles which we all consented, I created an evaluation dimension, which was very useful for choosing the most appropriate one. I have once faced with a dilemma: we felt excited about one entrancing design direction, but cannot make resolute decision as it also lacks feasibility to apply universally. Instead of discarding it away, I led our team to analyze why we loved this direction and concluded several “luminous points” which we found that can achieve in another practical way. It is not uncommon for us to come up with additional design points during the design process. Our design would be apparently more comprehensive if we include those additional points. However, it might not be better. This is because we had limited time both to design and to present, so we must ensure the main points could be delivered. So once encountered more ideas, we kept them in our “parking lot” temperately and evaluate what role does this point play in our entire design project: 1)Supplementary to our main points. 2) Integrating the main points. 3) The icing on the cake. 4) Further development. Then we incorporated the most important ideas and keep those valuable but not urgent ones on the list of the next iteration.